1. With lively and deep joy I find myself here in your midst today in this famous university, and I offer my greeting, united with sentiments of deep esteem for the culture that you represent and for this special place where it has had singular manifestations which have left an incisive impression on human thought. I heartily thank you for your kind welcome. In particular, I thank you, the Rector, for the noble words addressed in the name of the whole academic body. For one who knows the significance of the place whose threshold he passes, it is always mobbing to enter a university, but all the more so when entering this athenaeum which has numbered so many illustrious persons among its teachers and students and has recorded in its age-old history not a few episodes rich in interest and important references. We can almost see with us the elect band of learned men who in past centuries, sometimes amid great trials, have carried on the commitment to research and teaching: Nicolaus Copernicus, Cardinal Bessarione, Nicholas of Cusa, Pico Della Mirandola, Galileo Galilei, Guicciardini, Torquato Tasso, Telesio, Erasmus of Rotterdam, and numerous others. So many famous names, which along with many others since 1222, the date of its foundation consecrated by historic memories, have honored this university! I am happy at this moment to recall also those who studied here whom the Church has declared saints: Albert the Great, John Nepomucene, Cajetan of Thiene, Anthony Mary Zaccaria, Robert Bellarmine, Francis de Sales, Gregory Barbarigo, Saints, blesseds, future pontiffs, cardinals, bishops, theologians, philosophers, doctors, scientists, outstanding men of letters have been trained in these halls or have taught here. It is also reason for great joy for me to be able to stress the relationships of the University of Padua with my native country. Indeed, since the thirteenth century numerous Polish students were found in Padua, which then and subsequently prepared for Poland a large group of doctors, philosophers, botanists, mathematicians, those holding responsible positions in the ecclesiastical hierarchy. Because of this, in 1964, on the occasion of the 600th anniversary of the founding of the University of Krakow, I felt obliged to pay a visit to your athenaeum. Here too, in a certain way, beats the Polish heart, and I feel moved and thank you in the name of my country! In addition I would like to express the deep consideration I have for the social, civic, and political importance of this university in the context not only of the city, but also of Italy and other nations. It is a feeling that becomes anxiety and preoccupation for the determining and continual influence that this center of studies has on social life, on the formation of consciences and ideals, on the accomplishments of the present and the prospects for the future. 2. After this introduction I would like to speak briefly with you about two fundamental goals of the university, the scientific and the pedagogical, with reference also to the very meaningful motto that has been your ideal and program for centuries. Universa universes patavina libertas, which I think intends to indicate the spirit with which this athenaeum has risen and the broad mindedness with which the citizens of that time welcomed it, putting its freedom as it were at the disposal of everyone. From its very beginning the university was conceived as universal in the sense that it is an institution open to everyone and dedicated to cultivation every form of knowledge and to studying truth in its every expression: scientific, philosophical, theological. You therefore carry out at the university the search for truth in all sectors and the transmission of it through teaching. The truths proper to the different branches of reality are studied in an ordered, systematic, and thorough way in the distinct sectors into which the university is divided: faculties, institutes, departments. But the university as such has as its task the study of the whole truth, and only from the awareness of this does it draw valid criteria for organizing and conferring significance on the studies of the individual sectors. Now the study of truth as such, as you know, is the duty of that noble discipline that is called metaphysics, which puts in their place the different aspects of truth and integrates them hierarchically, reconstructing on the plane of knowledge that profound unity of things that is already realized on the plane of being. It is important that this superior vision in which the specialized spheres of knowledge are integrated and unified be cultivated in a center of studies such as this. In fact, what essentially and specifically constitutes the university is precisely this superior unity of knowledge that is acquired above all through metaphysics, particularly all through Christian metaphysics, which confers a human and Christian meaning on all the branches of knowledge and in this way assumes them into a global view of reality. From this arises the need for every university that wishes to renew itself and rediscover its true mission to shed light on its principal goal, that of the study of truth in its every aspect. Coming here today in my capacity as the humble Vicar of him who is Truth, I address you not only as believers but also as scholars, and I ask you to love, seek, cultivate, study and teach truth, so that you may be able to grow interiorly and have your students grow. 3. The other goal of the university, to which I wish to draw your attention, is the pedagogical one, which has as its scope not only the instruction, but also the formation of young generations. The phenomenon of education is a typically human one, since only man can and must be educated. Through educative work he is individualized in the various sectors of existence and as a result of being individualized, he becomes ever more completely an “I,” a person also on the psychological level, after having been a person on the ontological level right from his mother's womb. Obviously, the conception of education that one has depends on the conception he has of man and his destiny. Only after it is well understood who man is in himself, and what is the ultimate goal of human life, is there correctly and logically posed the question of how to lead him to the achievement of his personal goal. Realizing the elements of human nature, Christian authors, and not rarely non-Christian ones, insist on the necessity that in the young person in training and eve in the adult the spiritual dimension he cultivated, which is the dimension of “being,” rather than “having.” In this regard I wish to recall once more what I said about culture to the representatives of UNESCO during my visit to their headquarters, in order to confirm that in education greater attention be given to the dimension of the spirit (cf. n 7, AAS 72, 1980, p. 738). The objective of education must always be to make man more mature, that is, to make him a person who brings to perfect fulfillment all his potentials and attitudes. This is achieved through a patient study and progressive assimilation of absolute, perennial and transcendent values. Historically, every society has constructed for itself a human pattern, an ideal for humanity, on which to shape its citizens: the hero, the wise man, the knight, the orator, the philosopher, the scientist, the technocrat, etc. For a society that wants to take its values from Christianity, of be inspired by it, the pedagogical ideal must be Jesus Christ who is the most perfect realization of the image of God imprinted in man. Opposed to this view is a hedonistic and consumeristic society which, by seeking to erase the spiritual dimension of man's being, for this very reason is depraved of every authentic pattern of humanity to propose to its members. This in my option is the principal reason for the serious breakdown whose victim is today's youth, who, precisely in the most important phase of their formation, as the foundation is taking place in the university, find themselves deprived of ideals to follow and patterns of true humanity to realize. This also explains some symptomatic forms of violence by which certain groups express their dissatisfaction or are under the illusion that they can realize, with acts of terrorism, fallacious design for new societies. 4. On of the most important values to keep in mind in the formation of a person is freedom. This however, is among the values that are greatly misunderstood and most seriously violated by the society in which we live, despite the fact that modern culture has made it its banner. This is due to an erroneous conception that makes man a supreme and independent being, while he is a created being who depends on God. He is a finite and social being who for his birth, his development, his survival, constantly needs the help of beings like him. In the triangle that is formed between “I,” others, and God, freedom finds its meaning and goals for which to commit itself completely and exert itself constantly. In order to restore to man a freedom that is truly such, it is therefore necessary above all to recapture that religious and metaphysical vision of man and things, which is the only vision that determines the right and measure of the human being and his relationship with his fellow human beings and with his surrounding environment. Once this order of ideas is accepted, we must commit ourselves without delay to rescue freedom from those ideological errors that end up denying it, and from all those political, social, economic, technological manipulation and oppressions that threaten to suffocate or annihilate it. At the same time, we must work incessantly to educate man in the proper use of freedom, proposing to him true and noble ideals of life and helping him to work to put them into practice. It seems to me that these reflections can be applied also to the ancient and singular motto mentioned before, to which are connected many of the glories that constitute the pride and the specific nature of the athenaeum and which I have learned with great interest. 5. 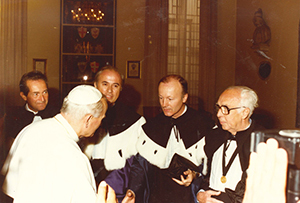 At the conclusion of these reflections I address you teachers, who often dramatically feel your responsibility as educators and sometimes also experience bitter disappointment, and I repeat to you the words of the Second Vatican Council: you have a marvellous and very important vocation! (cf. Gravissimum Educations , n. 5). Whatever may be the subject of your interests and your teaching, do your utmost with seriousness and enthusiasm to form men who are lovers of authentic culture and genuine freedom, able to give personal judgments in the light of truth, committed to achieving all that is true, good and just. Through you and their representatives who are in this hall, I cordially hope that all the students of this university find in it the helps and examples necessary for a complete cultural and human formation, and particularly that they breathe here that air of true freedom which is able to foster a continual growth, the sense of duty, and respect for others. On the coat of arms and on the seal of your athenaeum are printed the images of Christ the Redeemer and St. Catherine of Alexandria, respectively patrons of the two studies that originally made up the university, that of “artists” and that of “jurists”: Christ, the Way, the Truth and the Life; a woman who according to tradition was the cultivator of philosophy and theology and gave her live for the faith. To these patrons I commend each one of you, all the students, all the personnel of this university, together with their problems and their expectations, and wishing for you an ever more vigorous and effective cultural activity, I invoke upon everyone the blessing of the Most High, that he may enlighten you, guide you and comfort you. Source of the English text: L' Osservatore Romano, Weekly Edition, 1982, Setember 27, pp. 5-6.